Second of five children born to Michael Rodzinska and Marianna (née Sekuly). Michael was the church organist, led the parish choir and worked at a local bank. They were a poor but pious family, and though Marianna’s family was wealthy, they refused to help. Marianna died when Stanislawa was eight years old, and the family fortunes deteriorated further as Michael had trouble working and caring for the children; he died of pneumonia when Stanislawa was ten. From that point, she and her sister grew up in a Dominican orphanage. Stanislawa loved the Dominican Sisters so much that she joined them in 1916 in Tarnobrzegu-Wielowsi, Poland, taking the name Sister Maria Juliana and made her profession on 5 August 1924. She served as an exceptional and much loved teacher at Dominican orphanages for 22 years. Superior of the Dominican house in Vilnius, Lithuania in 1934, and ran the orphanage; she became known as the Mother of Orphans for her tireless care of the children, and as an Apostle of the Rosary. She was awarded by the secular government of Vilnius for her work. However, the government seized the school and orphange, took over running both, and dissolved the monastery; the now homeless and unemployed Dominican sisters where taken in by some local Vincentian sisters. Mother Maria Julia and her sisters tried to support themselves doing odd jobs, but the Nazis invaded, the economy tanked, and the Church effectively went into hiding. Clergy, monks and sisters were arrested, imprisoned or executed, teaching Polish culture was made illegal, so everything about Mother Julia was now against the laws of the invaders. She continued to covertly teach children catechism and regular school studies, and worked to keep elderly priests from starving after they were kicked out into the streets by the Nazis. Mother Julia was arrested by the Gestapo on 12 July 1943 for her work, and was imprisoned for a year in solitary confinement in a cement cell in the Lukiškes Prison in central Vilnius; it was too small and cramped for her to stretch out. She did not break, however, and continued doing her spiritual exercises. In July 1944 she was loaded into a cattle car and shipped to the Stutthof concentration camp where she was tortured, starved and abused; she responded by forming prayer groups and shared what food she received. She contracted a fatal case of typhus while nursing infected Jewish female prisoners. Martyr. Born to the nobility, Eucherius was a very pious in youth, and highly educated; legend says that his pregnant mother had a dream of an angel who told her that her unborn son would be a holy bishop, and blessed them both. He took the cowl in Jumièges, Normandy, France in 714. When his uncle Suaveric, bishop of Orleans, France, died, the clergy and faithful asked for Eucherius as his replacement. Eucherius fought the appointment, but finally agreed c.721. He was an active, evangelizing bishop who often visited the monasteries in his diocese. When Charles Martel confiscated Church property to finance his war against the Saracens, Eucherius protested. After his victory, Martel exiled the reluctant bishop to Cologne, Germany. There he was greeted enthusiastically, even receiving the position of distributor of the governor's alms. He was then exiled to Hesbaye in modern Belgium where he retired to the monastery of Sint-Truiden. Born to the wealthy nobility, from an early age Pietro had a devotion to the Archangel Gabriel and was drawn to religious life. As a young man, he turned his back on his wealth and the world, being first a Celestine, and then joining the Franciscan Friars Minor. He spent his life travelling the region of the Marches of Ancona in Italy, staying in various Franciscan monasteries, dividing his time between zealous, eloquent preaching and contemplative prayer. 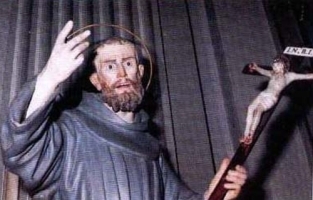 At the convent at Forano, Italy, he received a vision of the Blessed Virgin Mary placing the Child Jesus into the arms of brother Franciscan friar Saint Conrad of Offida. Pietro went into ecstacies in prayer, and at the Ancona monastery was seen to levitate. He had the gift of moving sinners to return to the confessional and to God. Learned priest in Ravenna, Italy, and then in Reggio Calabria, Italy. Bishop of Catania, Italy; legend says that an angel appeared in dreams to the people in Catania to point them to Leo. He fought to suppress blasphemous magicians that people in his diocese saw as an alternative to the Church. Leo opposed the iconoclasm ordered by the Byzantine Empire; the governor of Sicily ordered his arrest for this stance, and the bishop spent time in the mountains in exile, living as a cave hermit. Known always for his care for the poor. Though a priest, Wulfric led a worldly life, interested more in hunting and parties with local nobles that in tending to his flock. For unspecified reasons he suddenly realized the error of his ways and repented. Some say it was due to a chance encounter with a beggar; others that he was suddenly moved by recitating the Lavabo verse: "I will wash my hands among the innocent." Determined to change his life, he retired to live as a hermit near Hazelbury, Somerset, England. He received the gift of prophecy. Counselor to King Henry I and King Stephen. Copied and bound books, and crafted items for use in the Mass. Some orders have tried to claim that Wulfric was a member, but he never joined any. Youngest visionary of Our Lady of Fatima in Portugal in 1917. Evangelized the Franks. Bishop of Tournai, Belgium. Fought Arianism. Martyr. Brother of Saint Foila. Friend and teacher of Blessed Alcuin. Abbot of Clonmachnoise, Offaly, Ireland. Many of his spiritual students spread out across France, becoming influential teachers in imperial schools. Baptized by Saint Patrick. Studied in Gaul. Bishop of Derkan, northern Ireland. Bolcan's school there was one of the best equipped in the island. Bishop of Tyre, Phoenicia (modern Sur, Lebanon). Martyred in the persecutions of Diocletian. Niece of Saint Clare of Assisi. Friend of Saint Dominic de Guzman. After a misspent youth, Amata was miraculously healed by her aunt Clare, and became a Poor Clare nun herself. Tortured and martyred in the persecutions of Decius for permitting Christian worship in his home. Physcian. Priest in Sidon. Martyred in the persecutions of Diocletian. Bishop in Egypt. Tortured and martyred in the persecutions of Diocletian. Bishop in Egypt. Martyred in the persecutions of Diocletian. Bishop of Emesa, Syria. Martyred in the persecutions of Diocletian. Bishop of Maastricht, Netherlands from 495 till his death. First bishop in Couserans, France.